Two sisters will launch their first restaurant this spring to share their Japanese cooking experience with Vancouver diners. Monica Mo of Vancouver and her sister Mi Jung Mo, who will soon move to Vancouver from South Korea, plan to open Sushi Mo in a vacant storefront in downtown Vancouver. 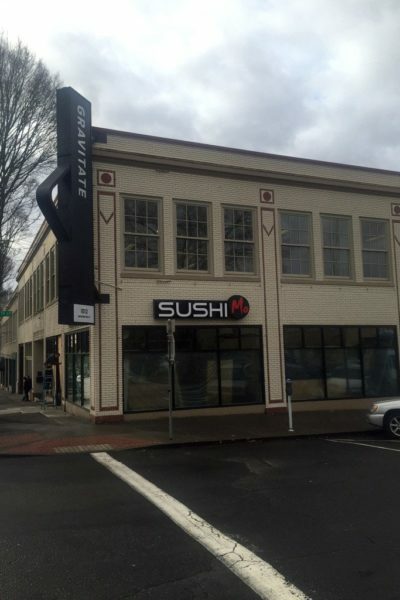 The sushi, hot food, saki and wine bar restaurant will open in the Gravitate building, which was the longtime home of Koplan’s Home Furnishings, at West 11th and Washington streets. Opening is set for sometime in March, Monica Mo said. Mo, who has restaurant experience, said she and her sister want to bring their family experience to a restaurant of their own. 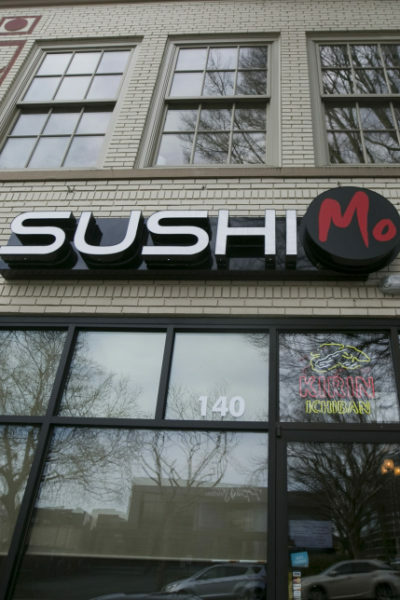 In addition to Japanese food, the restaurant will offer food selections from the sisters’ native South Korea, Mo said. “We thought it made perfect sense to name the restaurant after our family, because this is exactly how we plan to treat all of our customers — like family,” she said. The two women chose downtown Vancouver to fill what they saw as a gap in Japanese cuisine in the city’s downtown. “We think everyone should have the opportunity to eat and share great food, so with this prime location, we can bring delicious, healthy and authentic Japanese food to the wonderful people of Vancouver,” Mo said. Mo said she and her sister grew up with access to fresh and high-quality seafood from the sea near their home town of Masan, South Korea. The two women also worked with high-quality foods with the National Agricultural Cooperative Federation in South Korea. 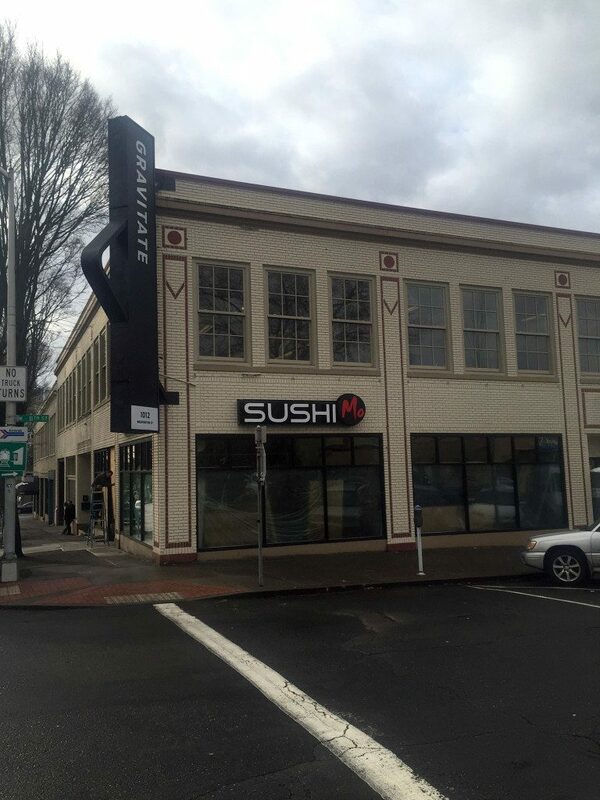 Locally, Mo said she worked at Japanese restaurants in Salmon Creek and in Beaverton, Clackamas and Hillsboro in Oregon, as well as Portland’s Pearl District and on Northwest 23rd Avenue. The sisters are also working on a website for the restaurant. 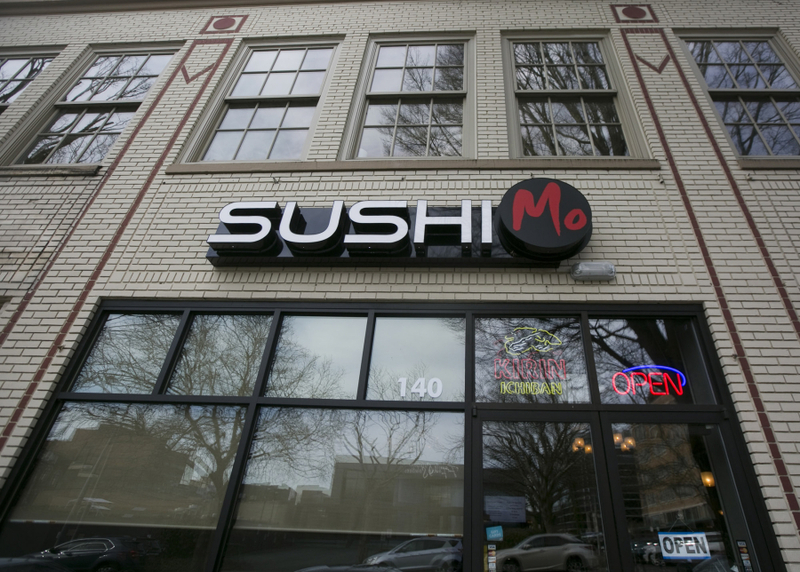 Why: Sushi Mo recently opened in downtown Vancouver, serving a full lineup of rolls, noodles, tempura, entrees, sushi, and sashimi. The restaurant is owned and operated by sisters Monica Mo and Mi Jung Mo whose goal is to provide healthful, quality Japanese food. They also have a few selections from their native South Korea. What I tried: My dining companion and I settled on the jalapeno bombs, the jack-in-the-box roll and the two-piece ahi and the two-piece octopus, both of which sat atop rice. The octopus was wrapped with a strip of seaweed. The jalapeno bombs were constructed with a deep-fried jalapeno half filled with spicy tuna, cream cheese, tobiko, a sweet sauce and sesame seeds. They were served warm and tasted wonderfully delicious. An appetizing balance of spicy and sweet with several textures, these are a must try. I especially enjoyed how the flavor of the jalapeno came through without overwhelming the rest of the ingredients. The jack-in-the-box is an Osaka-inspired, square-shaped roll with crab, avocado and masago topped with salmon, lemon and citrus aioli. The result was an amazing carousel of flavor that got better and more interesting with each bite. The lemon and citrus aioli complimented every element of the roll. This, too, is a must try selection. Both the ahi and the octopus were fresh and appetizing. 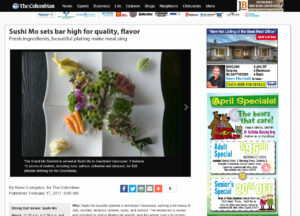 Each dish was artfully presented and served with ginger slices, wasabi and radish slices. Menu highlights beyond what I tried: The deep-fried Vegas roll made with spicy tuna, crab, cream cheese, mango and sweet sauce sounded good, as did the Downtown 1012 roll, which combines salmon, cucumber and masago topped with tuna, yellowtail, scallion, citrus dressing and a spicy sauce. Among the entrees are chicken teriyaki, katsu chicken or pork, miso salmon, beef yakiniku and salmon teriyaki. Yakisoba noodles with diner’s choice of vegetables, chicken, beef or shrimp are available, as is nabe udon. The appetizer selection is plentiful and includes edamame, fried calamari, deep-fried tofu, deep-fried or steamed gyoza and baked green mussels. A variety of ice creams, including tempura ice cream, are offered for dessert. Beverages include juice, tea, soda, lemonade and alcoholic beverages. Bottled alcoholic beverages are available for takeout. Atmosphere: The corner space on Washington and 11th streets has a comfortable modern decor. Seating consists of tables and chairs, and there are comfortable, red upholstered bar chairs at the bar, where the sushi chefs prepare selections. Attractive, multi-shaded light fixtures in addition to complimentary pendants bring a soft glow to the restaurant, just right for dining by. A few plants add a touch of greenery, and open, box style storage compartments hold supplies and emphasize the organized environment. Other observations: Of all the sushi restaurants I have tried in Clark County, Sushi Mo is far superior. This restaurant sets the bar high. The food is fresh, expertly prepared and beautifully plated. The waitstaff is professional, polite and attentive. The atmosphere is clean, organized and authentically oriented. I appreciated the utensil quality chopsticks instead of paper-packaged wood ones. Cost: For dinner, rolls range from $10 to $15. Entrees are $14 to $17. Sushi combos are $18 and $20. Noodles are $10 to $14 (add shrimp or vegetable tempura for $3). Tempura is $14 and $16 and is served with miso soup, a house salad and rice. A tempura combo with eight pieces of nigiri is $22. Appetizers cost $4 to $9. Sides are $2 to $6, and salads are $4 to $15. The lunch menu entrees are $10.50, noodles are $9.50 and combos are $7.50 to $13.50. Desserts cost $6 to $8. 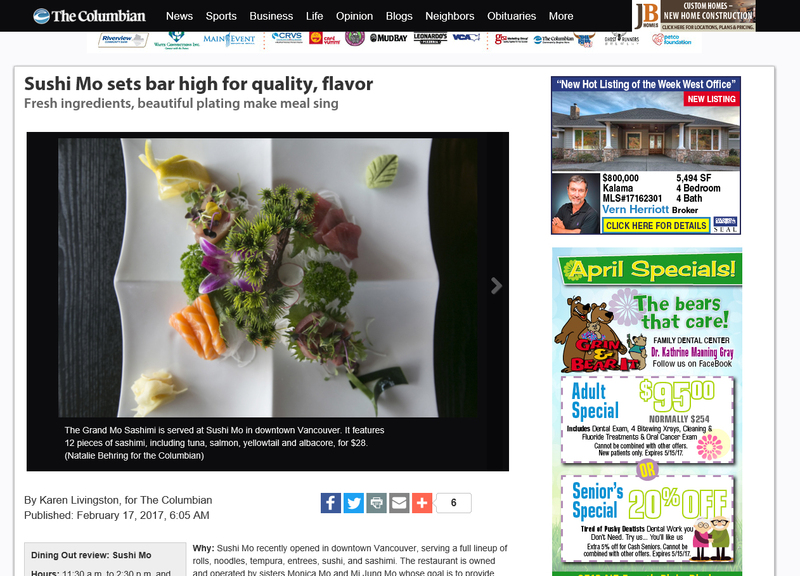 Thanks for finaⅼly taⅼking aboᥙt >sushi mo – vancouver <Liked it!